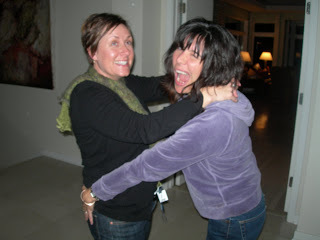 Happy Almost 40th Birthday Kim! 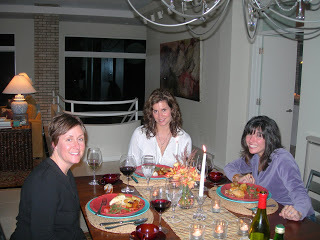 We celebrated tonight with a dinner here at the hacienda, Kim, Suz, and me, which is just how Kim wanted it – waaay low key. No surprises, no crowds, no big parties. 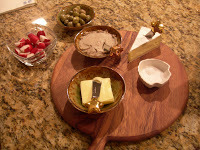 I set out some brie, pate, and radishes with Hope Creamery butter to nibble on while we had a champagne toast. To 40! To life! L’chaim! So we sipped and noshed and giggled (and drove John into the other room, ha) while the chicken finished roasting – yes, yet another roasted chicken, I can’t stop making the damn things. This time I prettily framed the bird with lots of carrots and potatoes, to soak up all the buttery pan juices and slowly brown and crisp alongside the peep. Worked nicely. To cut all the rich buttery-ness I made a green bean and last-tomatoes-of-the-season salad, seasoned with lots of last-tarragon-of-the-season dressing. Au revoir summer, kiss, kiss. For dessert I made simple cream puffs and filled them with coffee whipped cream. 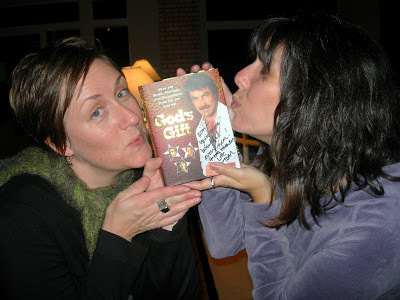 Add wine, and hot coffee, cheesy 70s tunes on satellite radio (for junior-high slow-dancing, of course), and plenty of pathetic, shriek-worthy beefcake courtesy of God’s Gift, and we called ‘er a birthday dinner, yes indeed.